Invite your friends to join with our convenient E-mail invitation. It's clear and easy to use. You can even add your own personalized message to let your friends know why you're excited about the League. Invite up to 8 friends at a time. You've joined a movement of over 400,000 Christians who are committed to Read, Carry and Share the Word of God. Millions of pocket-sized Gospels of John have been shared in the history of this ministry, most of them through simple one-to-one encounters. We make it easy! One Gospel each day, given away, transforms your life and those of the people you reach. As a member of the League, you can order Gospels every month. Just offer the booklet as a free gift. You'll be delighted at the response, with most people joyfully accepting your precious gift. We recommend ordering 30 per month and giving away one each day. Remember to update your profile any time your address or E-mail address changes to avoid problems. Your New Member Guide is a 21-page membership booklet that tells you all about your membership, complete with a detailed section on using the web site. Please download this file right now and read it carefully to make the most of your membership. The New Member Guide can be viewed using your web browser or Adobe Reader software, available free of charge from Adobe. Version 5 or newer is required. To download and save the Guide to your Documents folder, right-click on the link (Mac users Control-click), then select "Save link as..." from the popup menu that appears and choose where you want to store the file. Just click the link below if you want to open and view the Guide without saving it first. You're eligible to receive a free audio book as our gift to you for joining the League. 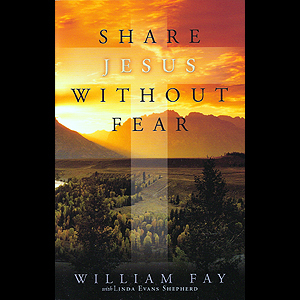 This 80-minute presentation will help encourage and motivate you to "Share Jesus Without Fear." Listen on your commute, while working out, or during a quiet time. Based on the book of the same name by Bill Fay, this presentation lays out the game plan for communicating the truth of the gospel in a non-threatening way. Mr. Fay is currently a chaplain with the Federal Drug Enforcement Agency and host of the internationally syndicated radio show "Let's Go." The late Dr. Bill Bright, founder and president of Campus Crusade for Christ said, "In my fifty-five years of witnessing for Christ, I have met few believers who were as enthusiastic and effective in their witness for our Lord as Bill Fay. He is a great blessing and inspiration to me." To listen to the streaming version instantly, click the "Play" button in the controller bar above. You can slide the controller to any part of the program to hear any portion of the presentation. Your free audio book is available in two formats: an mp3 file that you can listen to right on your computer or transfer to your non-iPod mp3 player, or an audiobook file complete with chapters and bookmarking -- perfect for use on your iPod or with iTunes. Please choose only one of these formats to reduce our bandwidth costs. Right-click the links below (Mac users control-click) to download any of these files. Note that these are very large files. Depending on your connection speed, it could take a very long time to download. To install the audiobook into iTunes, save the file, then open iTunes and choose "Add to Library" from the File menu. Navigate to the location where you saved the file and select it. The file will be added to your library. The cover art is not needed if you are downloading the audiobook version, because it's already embedded in the file. Need more help? Here's a detailed FAQ file for installing the audiobook file. We've created a nice personalized membership card that you can keep in your wallet or purse. Just download the convenient PDF (it already has your member ID and name on it), then print it out on any color printer. You have to be logged in, of course. Jump right in by using any of the convenient links above on the left side of the screen, or view the information below to familiarize yourself with the web site. The pages in the Membership section of the site explain how membership in the League works and ways to join The Pocket Testament League. Send your friends here, or use our convenient "invite a friend" feature. If you invite friends to join the League and they sign up, they can be linked to your account so you can see your ministry impact grow over time! Whenever you visit the site, click this menu item to "log in" as a member. This gives you access to all the member-only features like ordering Gospels. If you wish, you can choose to have the site log you in automatically each time you visit. This uses a cookie on your computer. We recommend this option only if you're not using a publicly shared computer. This section gives you more information about the League. You'll learn about our lengthy history, read the latest news, read our detailed FAQ, learn various ways you can support the League financially, view scheduled events and find contact information. We encourage you to donate so that we can continue to print Gospels to reach a world in need of the message of God's love. There are a number of ways that you can give, including recurring donations that allow small regular amounts to add up to significant amounts over time. We encourage you to consider sponsoring others who do not have the financial means to give, so that they can actively share their faith by giving away Gospels of John to others. Ordering Gospels and other resources is quick and easy! Just select the products you'd like, choose the quantity, then click the "Add to Cart" button. This puts them in your shopping cart. When you're done, click the "Shopping Cart/Checkout" link at the top of any page (next to your name). Confirm the quantities and proceed to the checkout page. Complete the information to finish your order. These sections represent the heart of our ministry tools. The Read menu provides information to help get you deeper into God's Word. The Carry section lets you order Gospels or any of our non-Gospel publications. The Share menu gives you tools to encourage you, like tips on sharing. Tell your pastor about the Pocket Powered Church program, so that everyone in your church can discover this wonderful sharing ministry for themselves. Our innovative Evangelism Boot Camp is a powerful 7-part program that will teach you how to share your faith. This self-paced course is sent by E-mail. You can take as long as you like to complete each lesson. When you're done, just click the "Lesson Completed" button at the bottom of your E-mail and the next lesson will be sent. It's completely free! You'll learn how to share your faith in all kinds of situations, with assignments for sharing. You can also share your experiences with other members at the same point in the program. Our Community section will encourage and bless you as you seek to share your faith. You can read stories from members and prayer requests for the people they're sharing with. Post your own stories and prayer requests. You can also view your ministry impact to see how many people have joined the League through your sharing efforts.